So how many pundits will say these three simple words: I. Don’t. Know. Around Agora Financial, he’s become known as the “crypto guy” because James knows gobs about digital currency, believes in the stuff…and still does. But before his crypto days, James was a venture capitalist, hedge fund manager and angel investor. “I’ve run a hedge fund that was successful,” says James. “I’ve probably analyzed the track records and strategies of about 1,000 different hedge funds. “Angel investors invest in early-stage or startup companies in exchange for an equity ownership interest,” Forbes says. The typical amount an angel investor injects in a startup is $25,000–100,000; that amount can go much, much higher, of course. For example, Uber’s first round of investment was a $1.5 million angel deal from First Round Capital. To give you an idea, those “first-rounder” shares are now worth more than 2,000 times the cash initially ponied up. But one thing’s clear — James believes in Uber. Indeed. Most of us don’t have a spare $1.5 million hanging around… or even $25,000. And James sees a lot of upside in Uber’s future — particularly when it comes to its ongoing need for IoT technology. That definition comes from TechTarget… and it covers all the bases. By the way, animals? We’re scrambling to figure that one out. Our best guess: Pets with identification chips. At the end of the day, IoT is the thing that allows your toaster to communicate with your oven… Imagine that conversation. Heh. James says: “In fact, [Uber’s] continued success is directly linked to the expansion of IoT. And that’s crucial because the “big gains in Uber have already been made in the private market. “Once that [IPO] happens,” James says, “it will be front page in The Wall Street Journal. So what’s James’ actionable angle? Since you can’t buy into Uber, what does James suggest you do as a backdoor way into this hot IPO? If you want to learn more about the best backdoor way to play Uber’s growth over the next few years, click here to get James’ report Pre-IPO Prospectus. To the markets, where the first guess at the Q3 GDP is 3.5%, notably down from 4.2% last quarter… which “does raise some fundamental questions about the outlook for the economy,” Econoday says. We take a look first at the Nasdaq — and you’ll see why below. The index is down 136 points, to 7,182.02. The Dow continues its slide, shedding 330 points to 24,655.56 while the S&P 500 has lost 44 points, to 2,662.56. Taking a peek at commodities, they’re the only bright spots today. Oil’s up — just 33 cents, but still up — to $67.66, and gold’s revving up, adding $10.50 to its price of $1,242.90. Bitcoin is down just $6, to $6,399.71. Turning our attention to the market story of the day: Amazon and Google earnings… and they both reported big-time beats. So what the…? 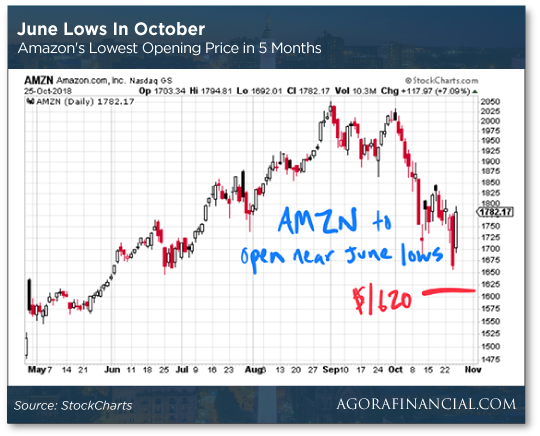 “While Amazon beat bottom-line estimates,” Agora analyst Greg Guenthner says, “it whiffed on revenue and offered lackluster guidance heading into the busy holiday shopping season. In pre-market trading, Amazon shares were down about 9% — that’s in line with an opening price we haven’t seen in five months. Google’s in on the action too; “Alphabet (Google) also missed analyst expectations as growth slowed in its search and video segments. The stock is down about 5% in early trade. That might be a harbinger of things to come today as any gains the markets mustered yesterday will probably be canceled. 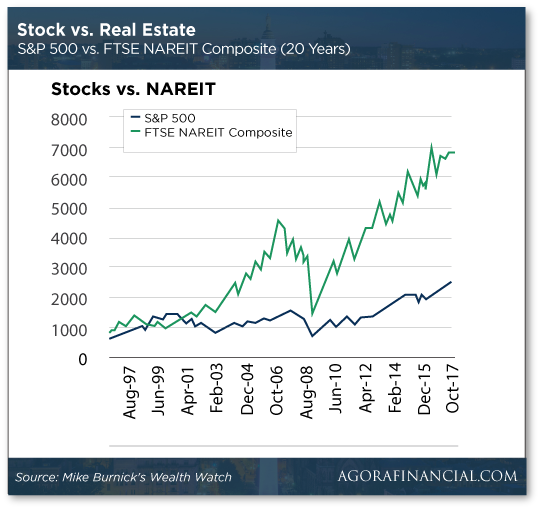 “The long-term, historical evidence is undeniable: Real estate has beaten the pants off stocks,” says our retirement and income expert Mike Burnick. “A $100 investment in the broad-based U.S. Real Estate Index in 1972 would be worth $6,839 today,” Mike says. “That is 68 times your money and more than double the S&P 500’s return over that same period. And — yes — that includes the Great Recession. On its own, real estate’s not a diversified investment. Not to mention if the neighborhood kid bounces off the trampoline in your backyard… heh. As Mike already mentioned: “There is a much easier, low-stress way to invest in real estate without all the hassles of being a landlord. 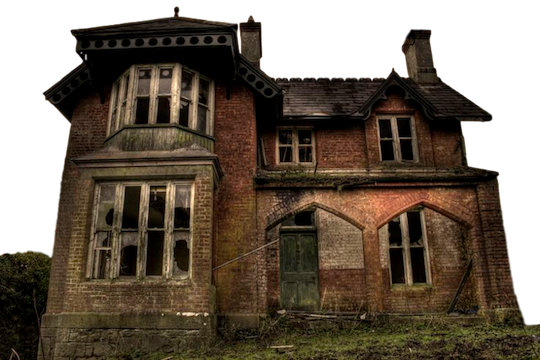 “According to Realtor.com’s annual Haunted Real Estate report, one in three people — especially millennials — are willing to take a chance on a haunted house,” Fox Business says. “In a competitive market, it’s harder for prospective buyers to be extremely selective,” says Danielle Hale, Realtor.com’s chief economist. Of course, a realtor might have to sweeten the deal to persuade a buyer to purchase the house on the block trick-or-treaters avoid. “Topping that wish list, according to the report, was a big discount at 15%, followed by a tie of either a larger kitchen or a better neighborhood at 9%. Almost an equal percentage of those surveyed said they wouldn’t need any incentive to buy a haunted home — we worry about them — with about 25% between the ages of 35–54 saying they wouldn’t be deterred from buying a house because of an alleged haunting. To which we ask: Gen X, have you learned nothing from ’80s horror movies? C’mon… Poltergeist? We’ll chalk it up to the hypnotic effect of the Ghostbusters theme: I ain’t afraid of no ghost! Here’s a question we’d like to see on next year’s Haunted Real Estate survey: Would you buy a house on Elm Street? P.S. Think you can’t get in on a pre-IPO opportunity? While that action’s mostly gobbled up by millionaire investors, James Altucher has a backdoor play into one of the hottest IPOs out there. But don’t wait… Uber’s about to file SEC paperwork to go public in 2019. Once that happens, Wall Street insiders will be the first to the table. If you want to learn more about James’ play — with “100% upside potential over the next 12–18 months” — click here now.